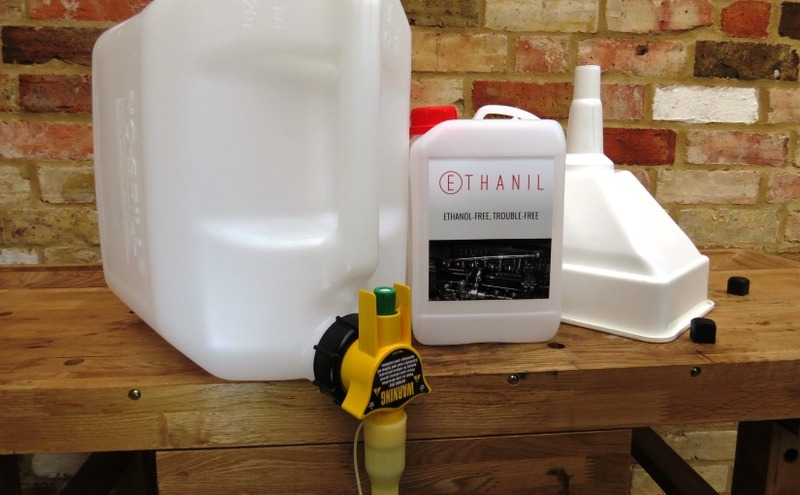 Ethanil® containers are to be used only for ethanol separation and must never be used for storage of petrol. When decanting petrol, there is always a risk of spark ignition due to static electricity. Always earth all containers, funnels, vehicles etc prior to opening any petrol container, so that the static potential is equalised and the risk of sparks minimised. Petrol is highly flammable. Ensure all naked flames are fully extinguished and your work area is clear and tidy before starting ethanol separation. Only use in accordance with the instructions provided. Dispose of waste products responsibly. Contents: 20 litre Ethanil Separator, 3 litre Ethanil Measuring Bottle, Ethanil Funnel (Standard) or Mr Funnel (Deluxe). Also required: 18 litres of pump petrol in a suitable jerry can, tap water. Fill the Measuring Bottle to the ‘Fill To Here’ line with cold tap water – this mark indicates 2 litres. Pour the water from the Measuring Bottle into the Ethanil Separator. Decant approximately a third of the petrol (6 litres) from the jerry can into the Ethanil Separator. Tighten the lid of the Separator securely, and vigorously shake for several minutes so the water and petrol mix thoroughly. The water will absorb the ethanol from the petrol. Repeat steps 2 and 3, adding another third/ 6 litres of petrol and shaking thoroughly. Repeat steps 2 and 3, adding the final third /6 litres of petrol and shaking thoroughly. The contents should reach the 20 litre mark on the Separator. Rotate the Separator 90 degrees and set on a flat surface where the tap can overhang a surface edge. Leave for approximately 60 – 90 minutes to allow the water/ethanol mixture to separate from the petrol and settle at the bottom of the Separator. Carefully position the open Measuring Bottle beneath the dispensing nozzle of the Separator and use the push button to decant the water/ethanol mix into the bottle. Stop decanting the water/ethanol mixture when the first drops of petrol start to flow from the Separator. You have now removed between 2 and 3 litres of water/ethanol mixture from the petrol. The ethanol concentration of the original petrol can be read from the scale on the side of the Measuring Bottle, and can be reported to other Ethanil users via our website. The petrol remaining in the Separator will be virtually free of ethanol. Immediately decant the ethanol-free petrol into an approved container or your vehicle. The water/ethanol mixture can be disposed of in an incinerator or at an approved recycling facility.